Several years ago, when Reagan and I were in MOPS (Mothers of Preschoolers) our group was responsible for an Operation Christmas Child box. After doing that, I knew I wanted to give boxes as a family. I even made it one of my 40 Before 40 Challenges and we accomplished it! 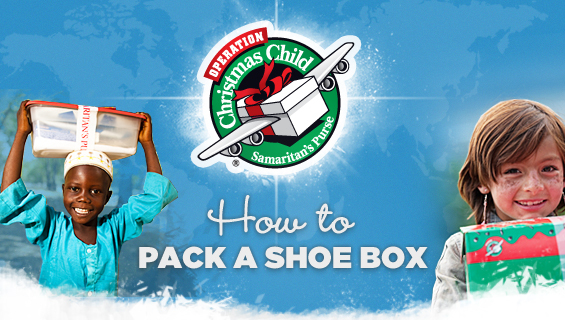 Operation Christmas Child is a part of the charitable organization Samaritan’s Purse. Samaritan’s Purse is a nondenominational evangelical Christian organization providing spiritual and physical aid to hurting people around the world. Since 1970, Samaritan’s Purse has helped meet needs of people who are victims of war, poverty, natural disasters, disease, and famine with the purpose of sharing God’s love through His Son, Jesus Christ. The organization serves the Church worldwide to promote the Gospel of the Lord Jesus Christ. So, the first thing you do is get a shoe box. You can use one of your own, or purchase a plastic one with a lid. They are only $1 at Walmart. Then you fill it with items for either a boy or a girl in the age groups or 2-4, 5-9, or 10-14 years old. 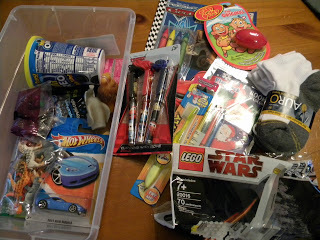 Some items you could put in the shoe box would be small toys like cars, stuffed animals, kazoos, and dolls. School supplies like pencils, paper, calculators, colors, and markers. Personal items like toothbrush, toothpaste, soap, washcloth, and comb. 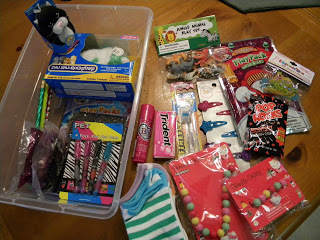 You can also include hard candies, gum, t-shirts, socks, jewelry, and hair clips. We had a lot of fun filling the boxes with things that our kids love. We also included a letter and picture from us talking about our family, what we like to do, and where we live. Next year, I would like to do boxes for the older age groups as I would expect they are likely the least to get filled. Photos like this one below, make my heart break. 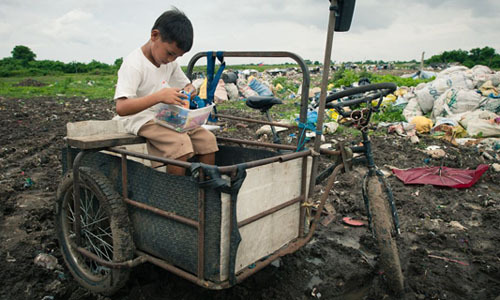 I know there are kids in our own country that have needs, but the conditions in other countries seem to be so unimaginable. When kids in other countries are asking for things that we take for granted like shoes and socks and pencils and paper, my heart says, I can do that! Our family will also be contributing to children in our community by purchasing toys and food baskets for the Christmas giveaway at Mission of Hope. The Operation Christmas Child boxes travel all over the world to some of the poorest places like Mongolia, Phillipines, Africa, and India. Our family is hoping the children that received our 3 boxes will take a moment and write back to us. We can’t wait to hear where our boxes traveled. The shoe box drop-off for this year has ended, but you can still donate money to help pay for the shipping costs to send all these boxes across the world. My mom will be traveling to Minneapolis to one of the warehouses where all the shoes boxes will be packed into larger boxes for shipping. She said there is always a need for money for adding items to boxes and for shipping. To make your tax deductible donation, go to http://www.samaritanspurse.org/ ! Be a part of bringing Christmas cheer and the love of Jesus to a child today! 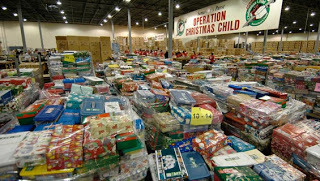 It is so weird that you started following my blog because I just found out about Operation Christmas Child…then I get on your blog and read more about it. How crazy!?!? Are you from the Benton Community area (noticed some of it in your pics)??? It is so good to meet another 'local' blogger!! !